Happy Wednesday! So, how’s your week going? 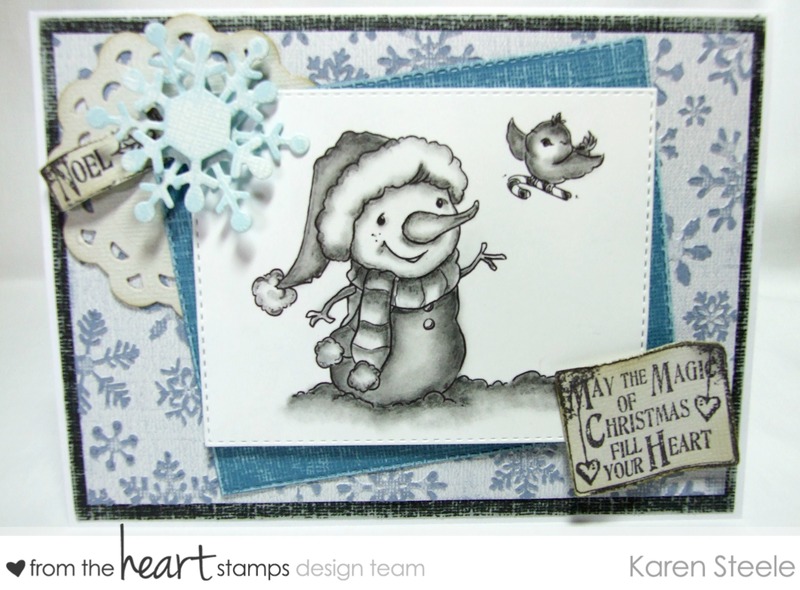 Well, today I’m sharing some midweek inspiration at From the Heart Stamps using this super sweet image called Candy Cane for Snowman. This was a Stamp of the Month image for August but it is available in the store. I’ve tried something new here, this is my first attempt at using pencils for shading the whole image! I saw a demonstration of this technique on the tv a while ago and thought I’d give it a go but just didn’t get round to it. But when I was shopping a few days ago and saw the pencils and blending stubs I took the plunge! I know that I need to practice but I’m quite pleased with how this turned out! I think that the shading gives an almost vintage/retro look to this image. I used coredination cardstock so that I could sand it back to give it a bit of a grungy look which is why I used my own sentiment stamps as I thought that these complimented that kind of look. I also used: Marianne Snowflakes Dies, Memory Box Stitched Rectangle Dies, Spellbinders Doily Die, Coredinations cardstock and Lili of the Valley Christmas Grungy Sentiments. Love it! Fabulous technique….and you definitely did an outstanding job! Darling card with snowman and bird with candy cane! Wonderful color with all pencil shading, too! Adorable! 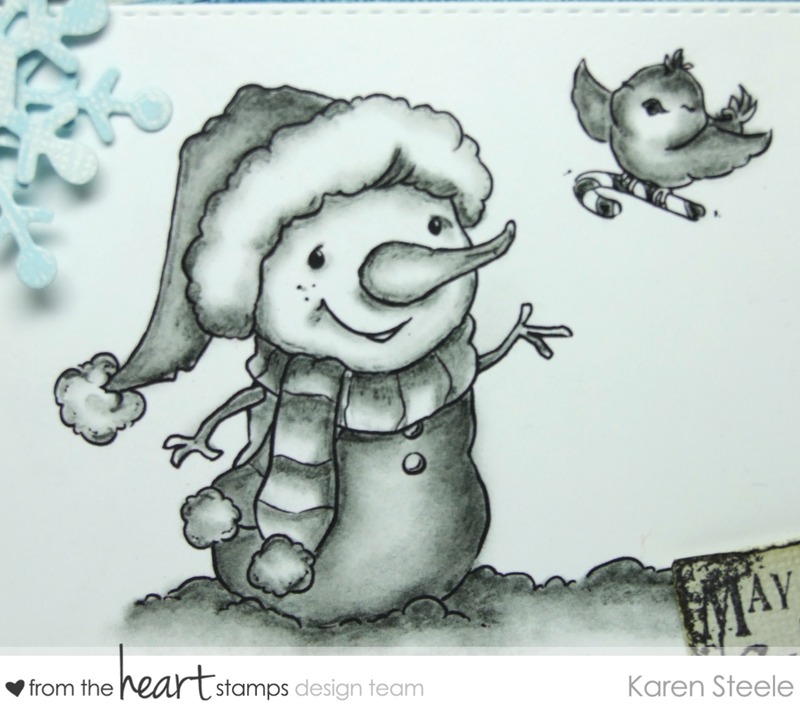 Love the snowman and great pencil shading! Oh my how beautiful. I saw this at the FTH blog and just had to come by, take a closer look, and tell you just how gorgeous the coloring (be it black and white) is! Love this, Karen! The black & white is so stunning! Karen – this is great!! Wonderful job with a new try. I am feeling inspired to try this! Ooooooo, Karen, I love this. Gives such a warm vintage feel. What a wonderful first attempt! Thanks so much Keren, I just thought it would make a change – and it’s a lot quicker than using colour! !